Another busy day, another project to juggle, and a stack of drawings to review. Amidst all the important application specific details, there's a callout for a 'hotbox.' "At least that piece will be easy," you say to yourself. Making a quick call to a colleague, a Google search, or an email to your local supply house rep will let you cross that item off the list to let you focus on the guts of the project. However, when you see that "hotbox" called out, it's important to know that you've got options that could actually substantially simplify the real work of your project. This article will quickly run through some of them - longer term this will open up new options for you that will save you time. That payoff requires just a few minutes to learn about the background of enclosures. Hotbox - Eponym or generic term? Just like Kleenex® (a facial tissue) and Coke® (a sweet, carbonated beverage,) Hot Box® is actually a brand name, not a product category. It has come to be used broadly and generically to refer to heated industrial enclosures. The product category has a number of manufacturers including Aquashield®, Water Safe®, VIT® and Safe-T-Cover®. The key, when you find a generic "hotbox enclosure" called out on a drawing, is to recognize that the requirement is for an enclosure. It may not even require winterization. In many cases enclosures are required by engineers and municipalities to satisfy other demands including climate control, (cooling as well as winterization) security, and aesthetics as well as theft and vandalism protection. Here's a quick guide to what's available to help you complete more projects, faster, at lower cost, with higher long-term client satisfaction. As you compare potential vendors, here are some suggestions for questions to ask and ways to distinguish. Let's start with the potentially most important factor. Believe it or not, your choice of enclosure supplier is about more than the generic vs. branded term. Instead, focus directly on the project design. Ask potential vendors if they have stock drawings of piping, valves and pumps that could save you reinventing the wheel - letting you get on to other projects and details faster. Also, since this is an ancillary item, you need these details quickly. That means pricing, drawings and lead-time details within a couple days of inquiring. In a real jam? Why can't you get the details in a matter of hours? Finally, "customer service" is often an empty term, but it can make your life either simple or complicated. Talk to supply houses to find out what experience they have, and make your own direct inquiries. Sometimes there's security in size. Market data is limited among privately held companies, so nobody knows for sure, but you'll find Hot Box®, Safe-T-Cover® and Aquashield® broadly distributed nationally. Anecdotally, the first two combine to make up the majority of the market. Want more detailed design suggestions? Check out our free eBook. Everyone wants everything fast - your clients do, and you do too. So far we're not aware of any same day drone deliveries, but you can often get a Safe-T-Cover® shipped same day. Up to 15 common sizes are warehoused in eight different locations around the US for immediate shipment and prompt delivery. Can someone help me size it? Can I get drawings? Quickly? How big of a heater will I require? This is the easiest comparison to make among vendors. Be sure to compare not only prices for stock hot boxes, but also for custom enclosures that are designed around your application. This is naturally critical to keeping your enclosure warm enough. It's important to account for the objective and the heater type. Enclosures are certified under ASSE 1060, and identified by class. For instance, "Class 1" requires the enclosure to maintain an internal temperature of +40F at an external ambient temp of -30F. 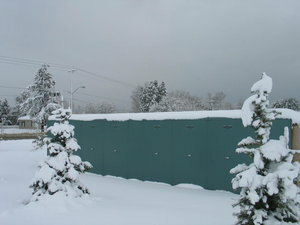 In many cases, winterized enclosures are used for systems that manage water flow, and in those applications it's common for the environment to be damp or moist. While the most effective way to maintain enclosure temp is to heat the slab, that places special demands on the heater because is often exposed to the damp conditions of the slab. So, don't treat the heater as an afterthought - compare vendor solutions for the heat source in addition to heat retention. Whether you're responding to an architect's aesthetic concerns or working to make the enclosure unobtrusive to minimize the attention of vandals, you might want to consider a custom color as an alternative to the industry standard brushed aluminum. Here are some standard options, and an additional range of available colors. Ask the vendors what options they offer. Don't get sidetracked by a generic term. When you see a hotbox called out on a drawing, consider your options. The enclosure you select should be designed around your requirements and simplify installation - not vice versa as happens all too often.